Tony Bennett: Still swinging and crooning with impeccable stylishness and über-coolness, and making his mark on the Christmas canon. Eight-five years old as of August 3, and still swinging and crooning with impeccable stylishness and über-coolness, Tony Bennett is making a run at his buddy Frank Sinatra’s heretofore-unchallenged supremacy in both the quantity and the quality of Christmas recordings in their respective catalogues. That Bennett’s Yuletide voice has not seeped into the culture to the degree as Sinatra’s is a bit of a puzzlement, but the Chairman did have a big head start, given that his first Christmas recordings were made in the 1940s. 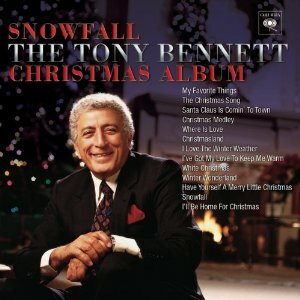 Or maybe there’s only so much room at the top, even if you can deliver a “White Christmas” as beautifully as Bennett did in working with a sumptuous Robert Farnon arrangement (Farnon himself had some Sinatra sessions on his resume—he knew from crooners and belters alike) on his masterful 1968 holiday debut, Snowfall. That gem, and others, can be heard anew on The Classic Christmas Album, a splendid anthology of Bennett’s various Christmas outpourings complete with a special feature called the Tony Bennett Ultimate Access Pass, which is free for three months and allows an immediate download of three additional bonus tracks—“O Christmas Tree,” “The Christmas Waltz” and, from the Snowfall album, a Christmas medley of "We Wish You a Merry Christmas/Silent Night/O Come, All Ye Faithful/Jingle Bells/Where Is Love"—along with a printable holiday card designed by Tony himself. 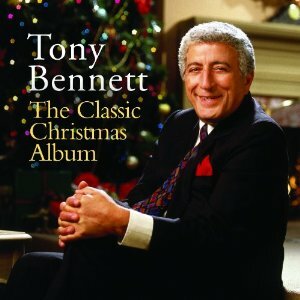 The Classic Christmas Album offers 18 tracks culled from Bennett’s three solo Christmas albums—the aforementioned Snowfall, 2008’s A Swingin’ Christmas (with the Count Basie Orchestra) and a 2002 disc for Hallmark Music, Christmas With Tony Bennett—along with a track from 1998’s concept album, The Playground; and two cuts from a 2001 holiday concert in Vienna featuring Bennett, Placido Domingo, Charlotte Church and Vanessa Williams, released on CD and DVD as Our Favorite Things. From the latter two projects come Bennett’s only missteps: blessed with a more muscular voice than, say, Sinatra, Bennett could belt out a lyric with impressive power, as is evident when he and Domingo go mano e mano in that department in the closing bars of a triumphant “The First Noel” as the orchestra swells behind them; but on the Vienna show’s “Have Yourself a Merry Little Christmas” and The Playground’s “Christmas In Herald Square,” it’s likely listeners will wince at the strained bel canto strivings in the songs’ ill-conceived big finishes when Bennett goes for an effect that would have been better achieved by maintaining the subtlety and the reflective tint he had otherwise employed throughout the songs. These valid objections aside, the rest of Classic is classic Bennett. With the Basie Orchestra he digs into a swinging version of “Santa Claus Is Coming To Town,” playing with the phrasing, keeping matters lighthearted as the brass blares and a sax wails a hot solo; engages in a coy duet with one Antonia Bennett on an engaging “I’ve Got My Love To Keep Me Warm”; and delivers a cool, jazzy reading of “Silver Bells” when not giving way to a zigzagging romp on the 88s by Monty Alexander. From Snowfall comes an intriguing “My Favorite Things,” rendered with a bit of a moody shrug that reminds us how the singer is looking for ways not to feel “so bad,” even as the orchestra frolics brassily behind him; and a superb bit of uptempo romantic crooning in a song Jo Stafford, his duly celebrated Columbia labelmate in the ‘50s, made a cornerstone of her own Christmas offerings, “I Love the Winter Weather,” with Bennett’s sleepy-eyed come-on bolstered by Farnon’s reedy arrangement. The Hallmark Music album, Christmas With Tony Bennett, was an occasion for the artist to examine beloved sacred seasonal standards--represented here by lofty treatments of “O Come All Ye Faithful,” “Silent Night” and “O Little Town of Bethlehem” on which Bennett’s precise, reverent articulation is gloriously supported by Farnon’s full, soaring orchestrations for the London Symphony Orchestra and Chorus—along with joyous but measured secular exultations as found in “Deck the Halls,” with its delightful interplay between Bennett and the female voices in the Chorus. For Bennett completists a previously unreleased track is included in “What Child Is This,” a tender, thoughtful interpretation done with a gravitas emblematic of the sacred moment marked in the lyrics, executed over a wonderfully nuanced arrangement marked by its sensitive deployment of strings and sensitivity to the storyline in those moments when the instruments fade to near silence. Other than the unidentified orchestra being arranged and conducted by Marion Evans, no other information—no date, no nothing—is published about this track, but it’s one of the album highlights, and on a purely spiritual basis the equal of the deeply felt ruminations marking Snowfall. 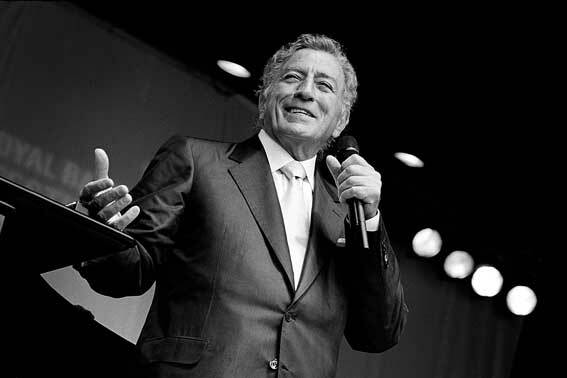 Tony Bennett, live at Rockefeller Center, 2008, performs ‘Winter Wonderland,’ with Monty Alexander on piano. The studio version from Snowfall is included on The Classic Christmas Album. Speaking of Snowfall, this most engaging affair, much of it recorded in London in 1968, locates the interpreter supreme in small combo settings backed by orchestra and also with full choir and orchestra (conducted and arranged by Mr. Farnon), allowing Bennett to display his stentorian singing style as well as the more subtle, sensitive approach he employs on his finest pop albums. The title song is a first-rate evocation of the Yule ambiance, with the gentle voice rising over a swirling wash of woodwinds and strings, establishing a comfortable mise-en-scene for the forthcoming traditional carols and holiday fare. A Christmas medley comprised of "We Wish You a Merry Christmas/Silent Night/O Come, All Ye Faithful/Jingle Bells/Where Is Love" is a marvel of contrasting moods--reverent, celebratory, even melancholy (the lush, crying strings on "Where Is Love" underscore the singer's search for something he lost and now desperately needs to recover)--and spirited ensemble singing, with Bennett sometimes harmonizing with the choir, at other times soaring majestically above their smooth crooning, thus adding an unusual degree of emotional edge to the performance. Enduring standards such as "White Christmas" and "Winter Wonderland" are, respectively, introspective and muted, and swinging and festive, beautiful renditions coming from entirely different perspectives. New to this reissue is a toe-tappin', finger-snappin' small combo workout with the Ralph Sharon Trio on "I'll Be Home For Christmas," from Bennett's appearance on Jon Stewart's MTV talk show. Further sweetening this repackage is a bonus DVD featuring five stellar performances from the artist's warm-hearted 1992 TV special, Tony Bennett: A Family Christmas. Even before this new edition appeared, Snowfall was a Yuletide classic worthy of Bennett's high standing in the 20th Century pop balladeer pantheon. Suffice it to say, nothing's changed in that regard.